Go to your next fancy dress party as a female rock star. Not only do you get to wear outrageous fashion styles you might not ordinarily consider, but you also have free rein to turn on your edgiest attitude for the night. 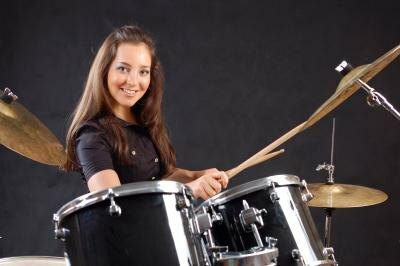 Whether you want to emulate a known female rock star or go as a generic variety, there are plenty of possibilities to work with. If you're a male, your costume is certain to get some laughs. A woman in a rock star costume. Rock stars don't have normal hair styles. To make yourself stand out from everyday Sues, purchase some temporary hair dye and go crazy with it. Bright colors, such as electric pink, green or blue, are the most effective; for an even more unique style, use a combination of colors. Female rock stars have been known to wear both short and long hair, so length is not an issue, although you can use a wig if you'd prefer a longer-haired look. Try out some blue hair. Black is the staple color of the female rock star; while brighter colors can work, avoid wearing anything that could be classified as cute. Tight-fitting black jeans or leather trousers are ideal, as are short skirts worn with fishnet tights and black boots. For your top, wear a black vest or short-sleeved t-shirt. Accessorize with bracelets, a studded belt, large chunky rings, a necklace and bangles; keep your look edgy by wearing dark or metallic colors. You might also consider a fake tattoo if you don't have any already, such as transfers or sleeves. A black, studded leather jacket. What instrument does your real or imagined character play in your band? Are you the frontwoman? If so, carry a cheap novelty microphone around with you. If you're the guitarist or bassist, check local toy stores for a cheap toy rock guitar you can use. If you're the drummer, get yourself a couple of drumsticks. This is possibly the most fun part of your costume. As a female rock star, it is your duty to make yourself the center of attention. Feel free to scream and stick your tongue out whenever you feel like it. Head-bang regularly and make copious use of the rock hand signal: a fist with the index and little fingers pointing up. If the music at the party is not to your liking, feel free to change it and put something heavier on.